Follow The Wiz into his mysterious world where you can collect obscure artefacts, brew potions and watch the dragons run wild while earning huge wins! This new game from Elk Studios feature 5-reels and 178 ways to win. Collect the different magic artifacts as you explore the magical world of The Wiz. If you are lucky, you’ll meet the Wiz himself as he casts his spells and transforms everything into gold resulting in even higher wins! And behold the Dragon as he will set anything he touches on fire! 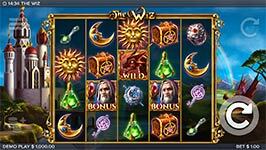 The Wiz is an action packed, highly entertaining 5 reel slot designed for Mobile First. It’s highly engaging game mechanics and stunning visual effects will keep you on the edge of your seat at all times, as the Wiz performs his magic to transform the reels, resulting in awesome wins through his epic journey through the realms. Dragon Multiplier Wilds – The wild dragon might appear in any spin, and when he does he sets all artifacts that he is connected to on fire. He carries a random multiplier, reaching from two to five, which he applies when he is part of a payline. The dragons always cooperate resulting in additive multipliers in case they are part of the same payline. Walking Wilds – The dragon turns into a walking wild when he appears in a Wizspin. He carries his multiplier as he moves leftwards reel by reel, and it is activated for every payline that he participates in. Not only will the dragons increase the win amounts but they also put the Wizspins on hold until they all have left the screen to the left.